Temporarily out of stock. ETA mid 3rd quarter 2019. Please add your name to our waitlist and we will notify you when they return. Buy with confidence. We've sold thousands of Behmor coffeemakers. Price will be $199 when back in stock, a drop of $100 from when the product was introduced and a remarkable price for a brewer with this much quality, capability and modernity. We do not anticipate more inventory of the Connected until the 3rd quarter of 2019. The first "connected" coffeemaker on the market, the Behmor Connected builds upon the strengths of the Brazen Plus Brew System to deliver coffee brewing with customizable features all controlled from a smartphone. The "internet of things" is upon us as our appliances get ever smarter and more able to deliver better living standards to us. Here it is now in a modern coffeemaker. 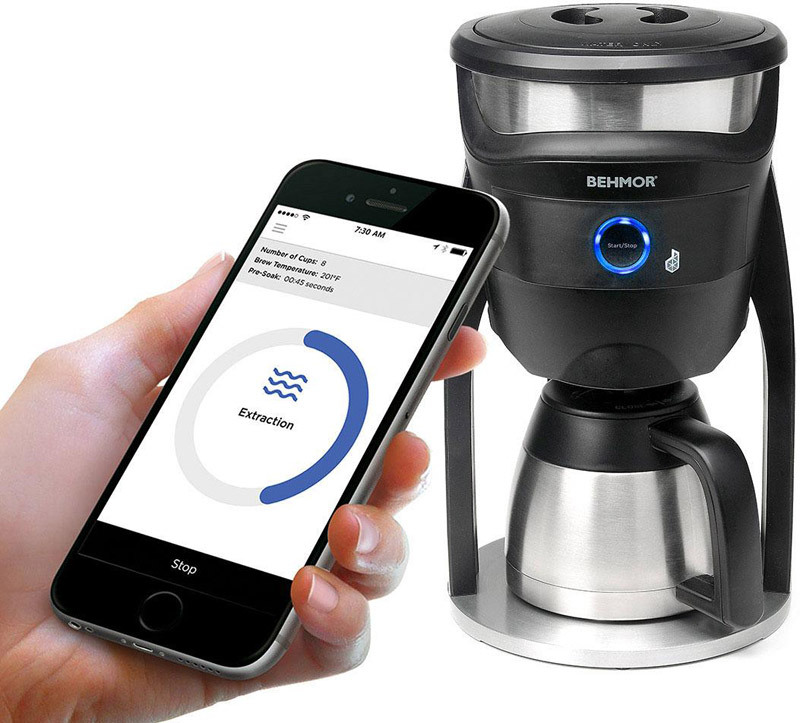 The Behmor Connected is a state of the art coffee brewer with never before seen technology that allows you to control your coffee maker experience from your smart phone. 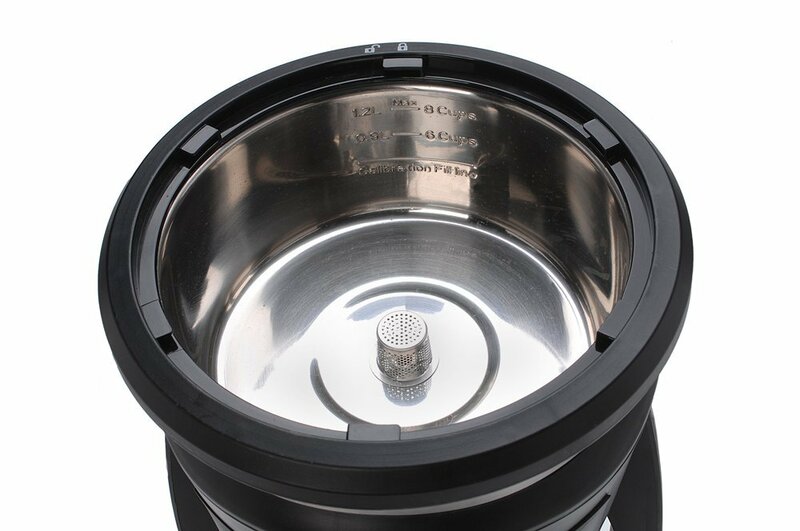 The Connected retains all of the great features of the Behmor System with an application designed by DADO that lets you control every aspect of the brewing process straight from your Apple or Android smart phone via the free Behmor application. 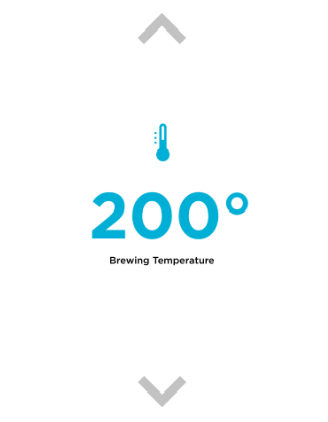 It allows you to adjust brewing temperature, pre-soak time, or simply select a brew profile and begin brewing. The app will monitor and keep you updated with the progress of the cycle and will send you a text message when the coffee is ready to drink. Alternately, you can use the button on the front of the brewer to begin the cycle if you want to use it without the app. The brewer comes with a 1.2 liter double wall thermal carafe to maintain coffee temperature. Water pulses from the oversized showerhead onto the grounds in a flat bottom brew basket and fully saturates the grounds. 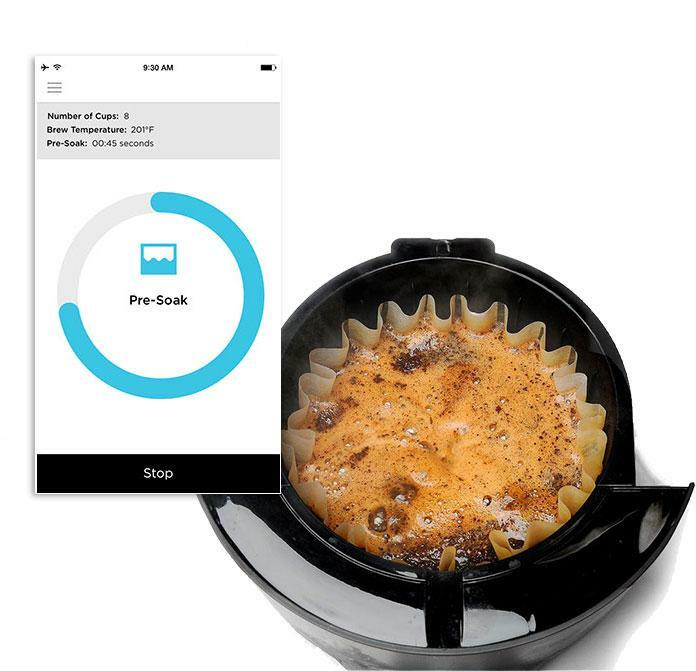 The ease of operation and convenience of the app allow you to make better coffee at home, from any room in the house. The Behmor Connected brews the coffee into a double walled stainless steel carafe that maintains your coffee's temperature for hours without a warming burner. The carafe has a brew through lid so the heat is kept in during brewing. The Behmor Connected heats water with a stainless steel reservoir on top of the machine. Heating the water from the top minimizes heat loss during the extraction process the the easy reach reservoir/heater makes filling and descaling simple. The Behmor Connected uses an oversized ground basket with a flat bottom for more even extraction than V shaped grounds baskets. A gold tone permanent filter is included or you can remove this and brew using paper filters. Use the Behmor connected app to control the number of cups being brewed, to adjust settings for bean type, and more. Capacity is 8 cups, 40 ounces. Permanent filter included or use paper filters. 1 year manufacturer's warranty when purchased from authorized Behmor dealers. Roastmasters.com is a leading authorized Behmor dealer.